Announcing the 80s Hairstyle Winners! The 80s gave us a lot to think about (and to try and forget): Member's Only jackets, parachute pants, track suits, New Wave, neon. But for those of us who remember this fluorescent, dance-inspired decade, hair is at the top of the list. This week's contest takes us on a trip down memory lane, full of mullets, side ponytails, and teased up glam rockers. 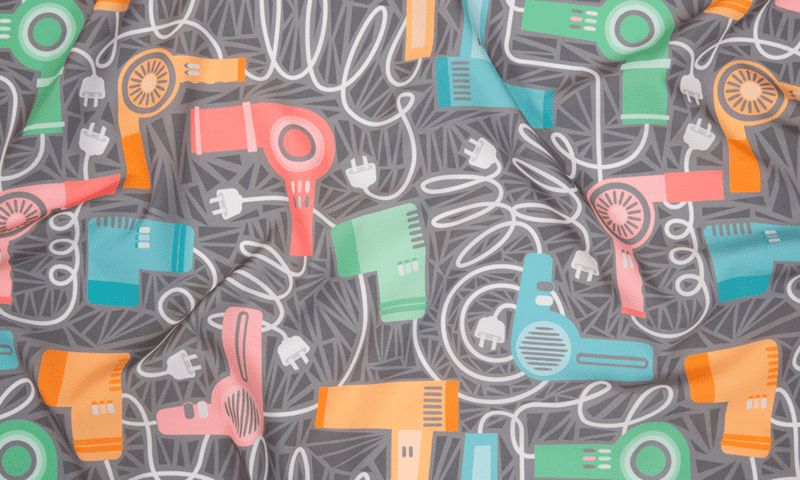 Congrats to our winner cjldesigns, and her winning design, "80s Hair Dryers." Be sure to congratulate all of the top ten winners of the 80s Hairstyles Design Challenge! [Read more…] about Announcing the 80s Hairstyle Winners! This is the eighth post in our series of project posts created for the Spoonflower Staff Quilting Challenge. Voting for this contest will open on Thursday, 3/14. 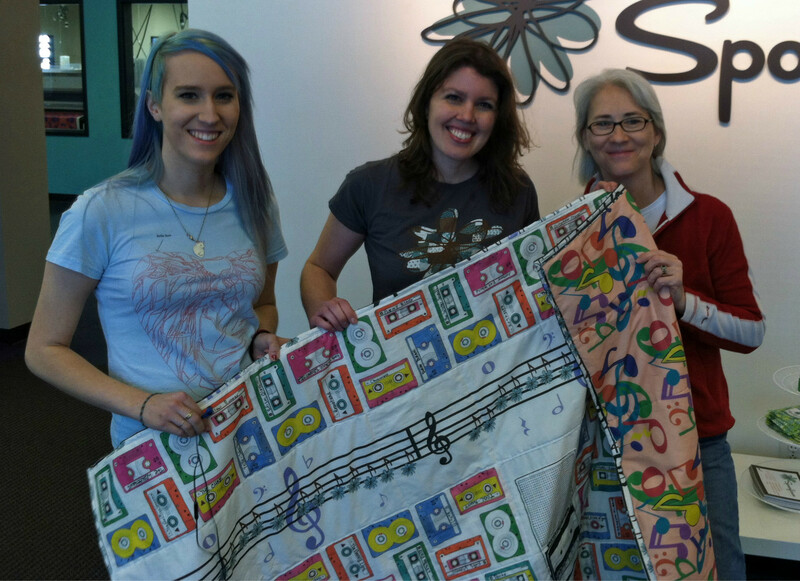 All three of us work together on Spoonflower’s operations team, so we were able to meet and discuss our quilt ideas regularly. Holly is an artist and seamstress, Paula is fabulously creative and has a long list of people already enjoying items made from her sewing machine, and Yoalder is a designer and DIY fix-it builder with absolutely no sewing skills at all. Our biggest problem at first was too many ideas! But finally we settled on one. The main theme of our quilt is old and new methods of listening to music. First, Holly drew some pictures of old cassette tapes, and she and Paula colored them in with crayons. 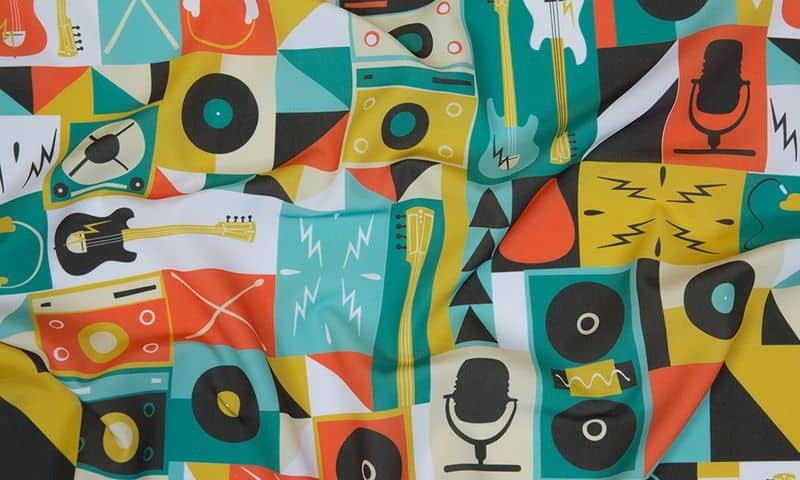 Fabric Of the Week Contest: 75 fabric designs with musical instruments – Vote! Our latest contest has drawn — in my humble opinion — an especially nice batch of fabric designs. From 75 fabrics with musical instruments, you now have a week to vote for all of your favorites. We'll take the winning fabric as of next Wednesday evening (May 5) and announce the winner on Thursday. In the meantime, be sure to check out our upcoming contests, including cocktails, puppet patterns and a (yikes! another) palette-restricted contest for 1950's-flavored textile designs. View upcoming contests.